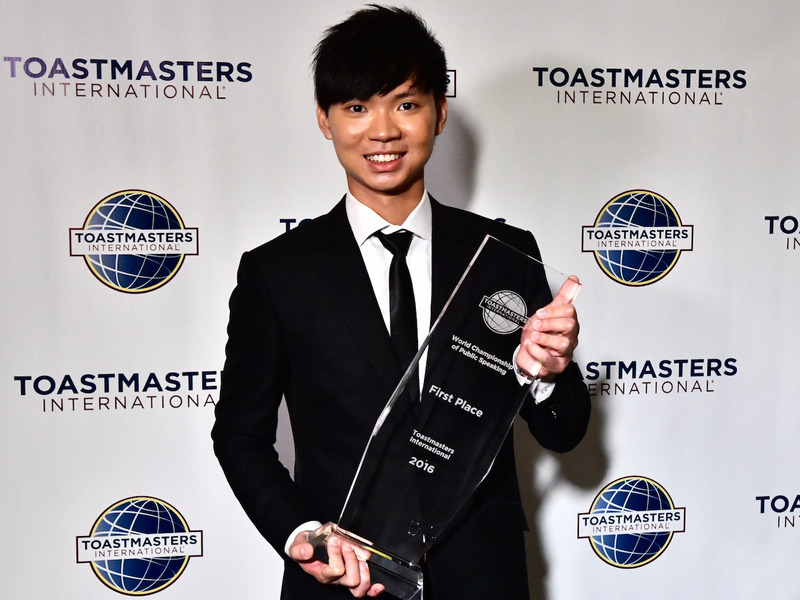 Toastmasters InternationalDarren Tay poses with the 2016 Toastmasters International World Champion of Public Speaking trophy. Darren Tay, a 27-year-old Singaporean lawyer, became the 2016 Toastmasters International world champion of public speaking in August, surviving several rounds of a competition that lasted six months and included more than 30,000 competitors from Toastmasters public speaking clubs around the world. Tay broke down his pre-presentation ritual that he uses to get those butterflies in order. We've asked many great performers about how they prepare for a presentation, and while they have different rituals, all agree that everyone feels a rush of energy before getting in front of a crowd and that it should be a driving force for a great performance -- Tay is no different. The thing is, many novice speakers fold under this nervous energy and while veteran speakers thrive off it. Stanford professor Kelly McGonigal explained the science behind this in her popular TED Talk from 2013, 'How to Make Stress Your Friend.' Stress (or nervous energy), she explained, is not inherently bad; your increased heart rate is meant to prepare your body for action, and it only becomes negative and exhausting when our conscious mind associates it with preparing for danger leading to failure. Tay explained that he collects his thoughts before a speech, allowing him to gain control over this adrenaline rush and use it to his advantage. Tay is a practitioner of mindfulness meditation, a secular exercise intended to keep you in the moment and in control of your emotions. It involves sitting quietly, eyes closed, and breathing deeply, letting your thoughts float by without being engaged. He does this for two minutes before taking the stage. Tay finds a private place and uses 'power poses,' inspired by renowned public speaker and performance coach Tony Robbins, who learned the practice from Harvard psychologist and author Amy Cuddy. As Cuddy has explained in a hit TED Talk and her book 'Presence,' the mind and body are intimately linked, and the mind is influenced by posture. When someone is feeling powerful, like in the wake of winning a race, for example, they will throw their hands up in the air. Therefore, she recommends mimicking some of these poses to feel confident. Before giving his presentation, Tay will take at least two minutes in private raising his hands above his head and stretching them wide. As with his breathing exercise, Tay uses posing to link his mind and body, with the intention of being fully present before his audience. Perhaps most importantly, Tay said, he reminds himself that a speech is for his audience's benefit, not his. This gives him purpose beyond trying to sound impressive and winning a title, if he's in a competition. 'My mentor told me that at the end of the day, your primary focus should be getting the message out and inspiring the audience,' he said. The message of this year's winning speech is that we are all our own worst bullies, and that the best way to deal with that is by acknowledging the presence of negative thoughts rather than fighting or ignoring them, as if we were observing a storm from inside a house. Tay began his speech with the story of a childhood bully and engaged his audience throughout. 'When an audience member came up to me and said, 'Wow, I felt a lot from your speech because I was bullied as well,' that's amazing,' Tay said.